Brilynn adapted this recipe from Tea Time magazine, and we made a few other minor tweaks. Lightly flour a work surface and roll out the crusts. Use a 2-1/2 inch round cutter to cut 12 circles from each pie crust. Line each cup of a 24-cup miniature muffin pan with the prepared crusts. Prick the bottom of each crust with a fork. Drain the cherries, reserving ½ cup of the juice. In a medium saucepan, whisk together the sugar and cornstarch. Gradually add the reserved cherry juice and brandy, whisking until smooth. Bring the mixture to a simmer over medium heat and cook for 1 to 2 minutes, stirring constantly, until the mixture is clear and thickened. Remove it from heat and stir in the cherries. 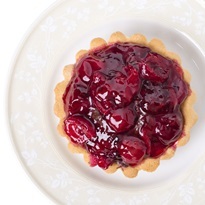 Evenly divide the cherry mixture between the par-baked crusts. Bake for 8 to 10 minutes. Remove the tartlets to a wire rack and cool completely. In a small bowl, combine the confectioners’ sugar, milk beverage and extract, whisking until smooth. Drizzle the icing on top of each tartlet.